Create a special wedding for you and an amazing celebration for everyone at the Gold Country’s Premier Wedding Venue! 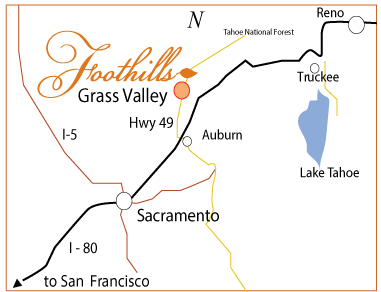 The Foothills Event Center is dedicated to creating a unique and memorable destination wedding experience as you begin your life together. Our team is experienced at transforming our elegant ballroom to make your day your own. Let us help you create a memorable event that you and your guests will be talking about for years to come! All weddings at The Foothills include our elegant Chiavari chairs, as well as tables to suit your needs. Choose from our selection of linens, décor, and other items available onsite so you can easily plan. Let us take care of the details so you can relax and enjoy your wedding day! Add ceremony, lighting, sound system, projector, screen, and more to any package! Midweek and Last Minute Specials are available. Add your wedding ceremony to our Classic Reception Package. Two additional hour’s rental on the day of your wedding. Add your wedding ceremony to our Pure Elegance Reception Package. Two additional hour’s rental on the day of event. Note: A certificate of liability insurance naming The Foothills Event Center as an additional insured with a minimum of $1,000,000 coverage is due 60 days prior to the event.